So we’ve got the men’s final that the seedings predicted, though with plenty of upsets along the way and two great semi finals, of which one, Djokovic against Del Potro, was a classic. Both winners in the men’s semis yesterday faced the problem of having to win against big hitters who provided different problems but one was the difficulty of getting into a rhythm. This was particularly true for Murray, playing against the promising, big serving and big hitting Jerzy Janowicz, the lowest ranked of the semi finalists. For Murray this was another potential banana skin, Janowicz had nothing to lose and came out firing bullets and, despite being set points down on his own serve, ran out the winner of the first set in the breaker. This is where Murray had to be patient, trusting in himself, as mentioned in the last post, having come back from two sets down builds confidence to deal with situations like this. While Janowicz’s serve is difficult for sheer pace, it doesn’t provide the variety that some players have and being patient, starting to pick direction comes after a while. The top players read the servers body, necessary when there’s only around half a second between the ball being struck and hitting the return. This is one of the reasons Federer’s serve is so difficult to break – he doesn’t hit the ball anywhere near as hard as some but can hit a wide range of serves off the same basic motion, making it one of the most difficult to read. It became clear during the second set that Murray was starting to pick the Janowicz serve, chipping the first serve back into play to get a foothold into the rallies and doing more when he got a shot at a second serve. Despite being a break down in the third set against a player serving bullets he didn’t panic and, form 4-1 down, managed to win five games in a row, breaking Janowicz twice, to take the set. Despite getting annoyed at the decision to close the roof at the end of the third, potentially disrupting the momentum he had built, he came back and broke early in the fourth to take the match. The final is tough to pick – Djokovic, dropped the first two sets of the tournament in his semi but played some of his best tennis to overcome a superb display from Del Potro – a big man who can hit the ball with frightening ferocity but also has great touch. Djokovic, himself, said that he believed it was some of the best tennis he had played at Wimbledon, which he needed, given some of Del Potro’s shots, particularly off the forehand. On the other hand, Murray despite a couple of challenging matches, has come through playing solidly and will have the benefit of the vast majority of the Wimbledon crowd being behind him. Djokovic has the edge, both in overall head to head and in best of five sets, however, Murray has the experience of outlasting Djokovic in a five set final, at the US Open last year and their only match on grass, the Olympic semi final last year, Murray won in a tight two sets. So Andy Murray dropped his first two sets of this Wimbledon but came through to win in five, from two sets down. The value of having done it before cannot be understated and, despite shortcomings in Murray’s performance, stand him in good stead for the rest of the tournament. 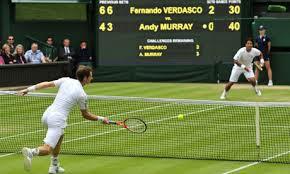 Of Murray’s last eight matches that have gone to five sets, he has won seven of them. 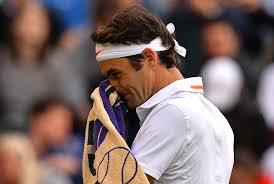 He has also won on Wimbledon’s centre court before from two sets down, notably against Richard Gasquet in 2008. Just like people and teams (both at work and in sport) get used to losing, winning can be a habit, as can the instilling of belief. Just like Manchester United have built a reputation for being able to mount a comeback or score late goals, if a player can demonstrate the ability to come back from the brink can create that inner belief that, whatever the situation, they know what it takes to win from behind. Additionally, it puts pressure on the other player knowing that their opponent has a reputation for coming back. On the other hand, while Murray’s game has developed over recent years, one weakness, which may yet be his undoing at Wimbledon is his second serve. 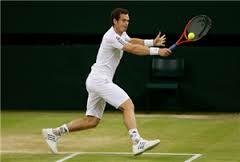 While Murray will regularly put down first serves in the 120-130 mph range, his second is often in the 70-80 mph range – the biggest gap between first and second serves of any of the top players and, consequently, he often has a low percentage win rate on second serve. This puts a lot of pressure on Murray to make a high percentage of first serves. Should he get through to the final, first serve percentage from Murray may be the key to the match. 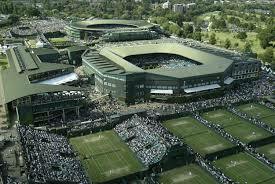 Wimbledon upsets for week two? Because it is the second week there are far less likely to be any upsets and this year the seismic upsets in the first week make it unlikely that we’ll see any more. However, to speculate where they might come, one interesting game today is that between Serena Williams and Sabine Lisicki. While currently Serena Is head and shoulders above just about everybody else in the women’s game (literally in most cases) – don’t rule out Lisicki. Not only does she normally play with a smile on her face but she’s hitting the ball as sweetly as anyone this Wimbledon and, if she can get her head right, she might trouble Serena. Other than this match there is little that might trouble Serena, though a potential next round against Laura Robson (who might get some added momentum out of the home support) might be interesting though unlikely to derail her. The men’s seems on course for a Djokovic – Murray final, though from early assessments that Murray was in the toughest section of the draw with the removal of Nadal and Federer his run to the final looks more straightforward than that of Djokovic. The highest seeded opponent he can face before the final is Mikhail Youzhny, who he plays today. Look out for Tommy Haas today against Djokovic – a potential banana skin. At the grand old age of 35, Tommy has regained the form that once had him ranked two in the world this year and his style of play suits grass and is the kind of game which could trouble Novak. We may even be seeing something of a resurgence of serve and volley tennis on grass, Tommy will be looking to get forward as much as possible and keep the points short. If Djokovic successfully negotiates his match against Haas, potential opponents are Berdych, in the quarter final (if he overcomes Bernard Tomic) and Del Potro or Ferrer could be ahead in the semi. Well, I obviously posted a little too early yesterday and missed the biggest upset of them all! Fedex has lost the express bit – after 36 straight grand slam quarter finals or better, he succumbed in the second round. Clearly, he was not at his best, from the second set on he there seemed to be an air of frustration, despite edging the first set on a tie-break he struggled to gain any rhythm against Stakhovsky, who served and volleyed consistently and, like Dustin Brown and Darcis before him this Wimbledon, kept the points short against a player that is comfortable from the back of the court. Take nothing away from Stakhovsky, he played exceptionally well, also he got to the net on 60% of points and winning two thirds of those. He came into the match with a clear game plan and would also have been buouyed by the other wins by underdogs against top players – when Brown upset Hewitt and particularly Darcis beating Nadal, it has an infectious effect. It also illustrates the depth in men’s tennis currently – after saying that the top four consistently get to the later stages of tournaments, here we have two of the greatest players of all time in Nadal and Federer, losing in the first two rounds at Wimbledon to players ranked outside the top 100. 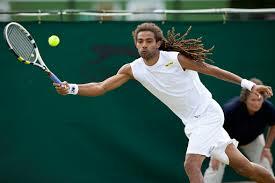 A great couple of days with more surprises, one of which was the defeat of 2002 champion Leyton Hewitt by qualifier and 189th ranked Dustin Brown. Dustin, at the age of 28, is demonstrating exceptional talent. Having spent most of career so far in the challengers. He came through three rounds of qualifying last week, in which he had not lost and was clearly match tight. He gave Hewitt no chance to get any rhythm, looking to end the points quickly. Maybe he has something of the laid back style of Derrick Rostagno – early in his career he travelled from tournament to tournament in Europe in a camper van funded by his parents. Not the privileged funding of some of the underachieving British players but also a little of the unconventionality in the way he hit some of his shots. Hewitt, for all his grit couldn’t come to terms with Brown and the mixed bag that he was dealt. Yesterday Feliciano Lopez dispatched the talented Frenchman, Gilles Simon. Lopez has the game for grass with a big serve and a great volley – someone who can benefit during the first week when the balls stay low. Watch out for Fernando Verdasco, now ranked 54, the former top 10 player overcame Julien Benneteau, no slouch on grass himself (he took two sets off Federer at last years Wimbledon). Verdasco served magnificently and hit well off the ground and used slice effectively. Unfortunately, his next match won’t be against Jo-Wilfred Tsonga, who retired with a knee injury today, when two sets to one down against Ernests Gulbis. Another story today has been the surprising number of retirements – dropping like flies it seems – along with Tsonga, Steve Darcis, Nadal’s conqueror, failed to make the second round following a shoulder injury he sustained while playing Nadal, Victoria Azarenka dropped out with an injury following a fall in her first round win, Radek Stepanek retired in the second set of his second round match and John Isner retired after only two games of his match today, while Marin Cilic also failed to make the start of his second round match. Questions are being asked about the courts, however, one thing that might be the issue of player movement. A number of players have commented in recent years that tennis has become more homogenized, the grass does not play quite as fast as it used to and on all surfaces, grass, clay, hard, in the slams the same players tend to make the final stages relatively consistently. What hasn’t changed, however, is the different movement demands of each surface, sliding on clay is relatively consistent throughout a tournament, whereas the grass at Wimbledon tends to have more moisture in it and be slightly softer early on. Consequently, there is a greater tendency to slide early and a need to get down lower. So while there is always more of a risk of injury on grass earlier in the tournament it doesn’t explain why there has been such a spate of withdrawals so early this year. And in a post script in the battle of the grunters – the good folk of SW19 will now know what it’s like to live in the Heathrow flightpath, after today’s match between Maria Sharapova and Michelle Larcher de Brito, two of the tour’s prime grunters. The result was unexpected – Sharapova slipped during the match and was heard to complain about the state of the court but Larcher de Brito still had to go and win it. Sharapova joins that other glamour girl, Caroline Wozniacki, exiting the tournament. Yes, today they seem to be dropping like flies! Nadal is out – a mix of an inspirational performance from the 135th ranked Belgian, Steve Darcis and clear limitations in Nadal’s mobility. There were occasions when Rafa pulled up short or didn’t chase balls that in full fitness he would have made. Darcis rose to the challenge of playing against the man some pundits tipped as a pre-tournament favourite. Nadal, even in defeat, demonstrated his class as player. Based on the maxim that if you’re on the court you’re fit enough to play, despite being clearly hampered at times, he made nothing of it, nor did he retire when some would have. When the match had finished he waited for his opponent before leaving the court and still had the courtesy to sine autographs for fans on his way off the court. So what of the other contenders today? In the men’s draw, following the age old tradition of the defending champion starting proceedings on centre court, it meant that in the men’s draw those who played were in the bottom half of the draw. Federer strolled against Hanescu – despite doing everything right Hanescu (I think he only missed one first serve in the first set) encountered Federer in sublime form, hitting the ball sweetly to the point of playing exhibition tennis. I’m not sure that it tells us much other than Federer, at the grand old age of 31, is still a contender, though should he reach a semi final against Murray or Tsonga the dynamics will be significantly different and both have had convincing victories against him this year. Andy Murray played solidly in brushing past Becker and Jo-Wilfred Tsonga beat the excellent young Belgian, David Goffin, in straight sets. Despite playing some excellent tennis on grass (Goffin had had a good run at Wimbledon last year) Jo-Wilfred always had a bit too much – he not only plays with power but also has excellent touch for a big man. It could be an interesting quarter-final match up against Murray. Earlier in the week we had the Wimbledon seedings announced and today the draw was made. There has been a lot of noise about seeding Rafael Nadal at number five. After all Rafa has had a phenomenal year, however, Wimbledon, while they have bucked the trend of the other slams in not sticking to the ATP rankings, they have been consistent in using a formula that combines the rankings with a players grass court form over the past two years. What’s the fuss about? Well the seedings keep the number one and two apart until the final and apart from three and four until the semis. By seeding Rafa at five, he was likely to meet one of the top three (Djokovic, Murray or Federer) in the quarter final. The complaints about Rafa’s seeding have, in the main, not come from the players but from others. Now the draw has been made we now know what the implications are – if Rafa is to win Wimbledon and results go according to the seedings he will have to beat in turn Federer, Murray and Djokovic. Obviously that also means that Federer has a similarly formidable task in needing to beat Nadal, Murray and Djokovic. I’ve not heard a complaint from either and, prior to the draw being made, Murray had said in an interview that he would be happy with having to play a quarter final against Rafa. The top players know they are going to have to beat others at the top to win the tournament and that’s the challenge that has made them the competitors that they are. It’s worth noting, for all of us, that we can’t always choose the things that happen to us but we can choose how we react to them!